Note: Yes, the cover really does say "The Master is back" even though this was the debut appearance of the Master. "I have come to destroy you Doctor, once and for all..."
The Earth is in terrible danger! The Master is back with an evil scheme to destroy humanity and silence the Doctor forever. His plan? To awaken the awesome power of the Nestene — a ruthlessly aggressive alien life form. Once mixed with plastic, they will form into faceless automatons, a willing army of destruction easily controlled by the evil Time Lord himself. 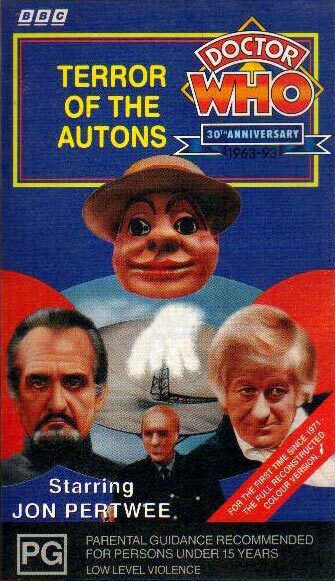 This is the terrible threat now facing the Earth — the terror of the Autons. 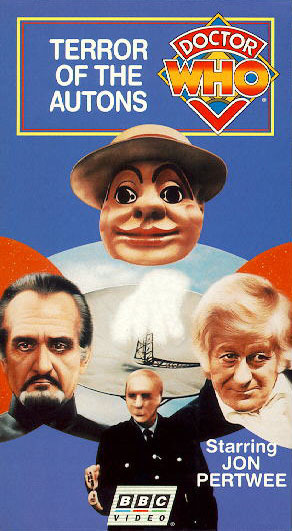 Originally transmitted in colour 2 - 23 January 1971, this four part adventure starring Jon Pertwee was lost in its original form. Only a black and white version and an edited colour American NTSC standard version remained until now when technology worthy of the Doctor himself has reconciled the two, synchronising them into one full colour version.